Now that the window dilemma has been solved (thanks for your feedback, guys! 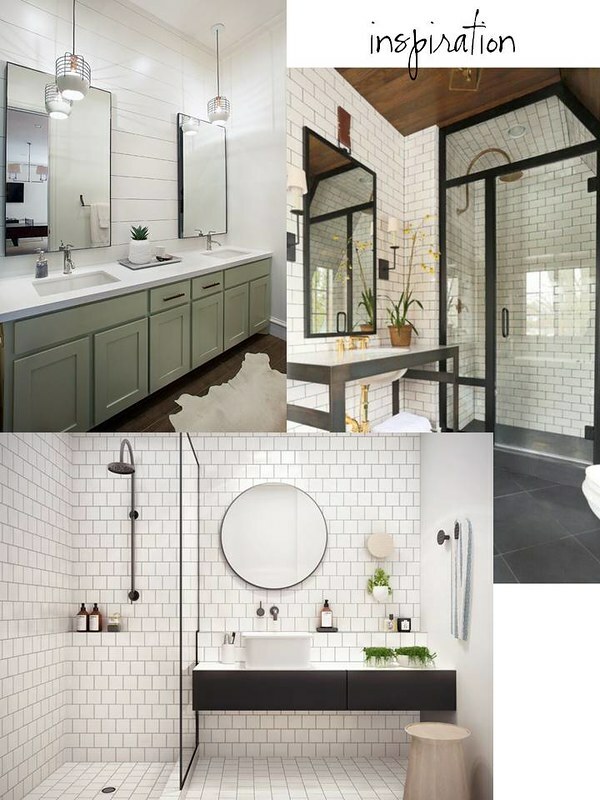 ), let’s move on to something super fun – the master bathroom design! The master bath is teeny-tiny and really hard to photograph, but basically you walk in and there’s a linen closet immediately on your left, followed by a bath tub. Moving to the right on the back wall is the toilet, then clockwise onto the right-hand wall is a sit-down vanity with a sloped ceiling above due to the roof line. Moving clockwise again, you’re back on the wall that you originally walked in through, and there’s a little sink. That’s it! The original layout just didn’t work, although I understand why they put the long run of countertop under that sloped ceiling (to take advantage of otherwise unusable space). But, I don’t think anyone wants a full-frontal view of the toilet to be the first thing they see when they walk into their bathroom. Or maybe that’s just me? So, we switched up the layout. The bath tub is turning into a walk-in shower, and a double vanity will run along the back wall so that it’s front and center (where the toilet used to be). 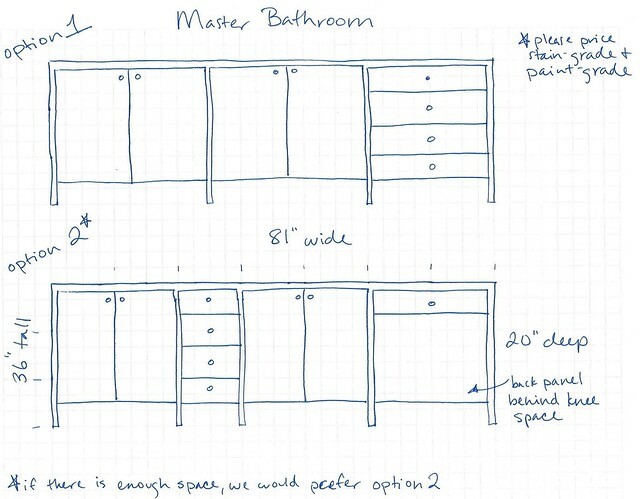 Either drawers or a sit-down vanity will be at the far end of the vanity where the ceiling slopes down to make use of that awkward space. The toilet is getting moved across the room to where the sink used to be (immediately to the right of the door into the bathroom). Oh, and we also framed out a larger window (the original window, which you can still see in that photo, was absurdly small). Anyhoo, now that you’ve seen what we’re working with, let’s move on to the finishes! I think that the 3 bathrooms below are just insane with their rustic/industrial details, so I took some very loose inspiration from them in terms of the design scheme. Sources, clockwise from top: Tracy Hardenburg Designs, Summer Thornton Designs, Fridcorp Residential Design. A full wall of subway tile with gray grout is a must. It will extend from the shower across the back wall above the vanity. 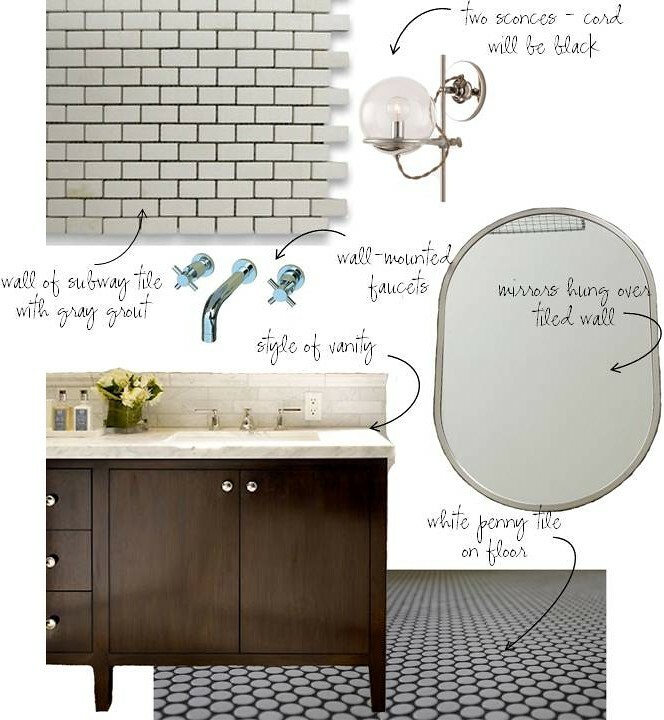 A round mirror is a great juxtaposition against all that angular subway tile. I’d originally planned to mirror the entire wall above the vanity, but now I’m nixing that. I’d like some industrial-esque sconces (they have to be sconces instead of pendants because of the sloped ceiling). I’m still on the fence about the floor tile, even though I love it. You see, the master bath is so small I worry that a large-scale tile will overwhelm the space – but maybe it’s actually a great counterbalance to the busyness of the wall of subway tile. Who doesn’t love penny tile? The penny tile would continue onto the shower floor. But maybe a white penny tile floor will be pattern/contrast/white overkill? Here’s a bathroom that kind of shows what this combination might look like. It’s also very easy to lay penny tile very badly, so that’s a consideration. Of course, gray penny tile is an option as well, but for some reason that idea doesn’t sound quite as appealing to me. All in all, I think the penny tile is out, but I’d like for it to make an appearance somewhere else – most likely the floor of the powder room. Hmm. 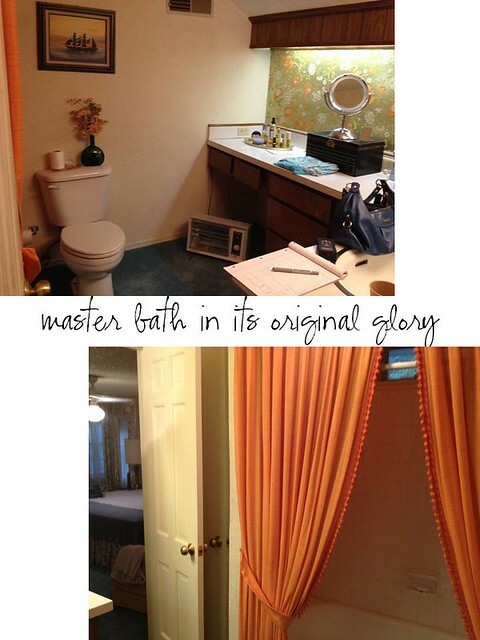 So, those are my thoughts on the master bathroom these days. What do you guys think? I think with gray grout the penny tile is too busy (too many strong lines). I like the gray floor tile –and if you think that it is too large maybe you can use smaller tile with the same layout. 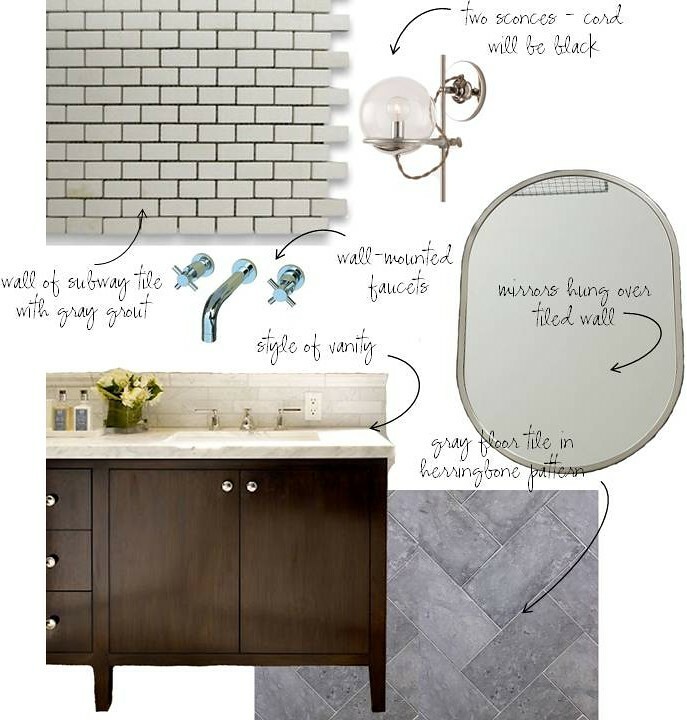 You might even be able to use any gray tile with matching grout to get the look. What I like in the first mood board is the the floor tile is interesting but doesn’t compete with the wall. If you are using gray grout then the tile and the shape of the tile on the wall is the focus. I tend to like things simple (but beautiful) and find too many things that yell “LOOK AT ME” distracting. I like everything except for the dark grout in the penny floor tile. I wish that we had a project house to flip. I just find it so overwhelming to know how to get started but you always do a great job with your flips. Those look like some pretty awesome ideas for the bathroom! The second option looks wonderful and elegant. So pretty. Can’t wait to see how this turns out! 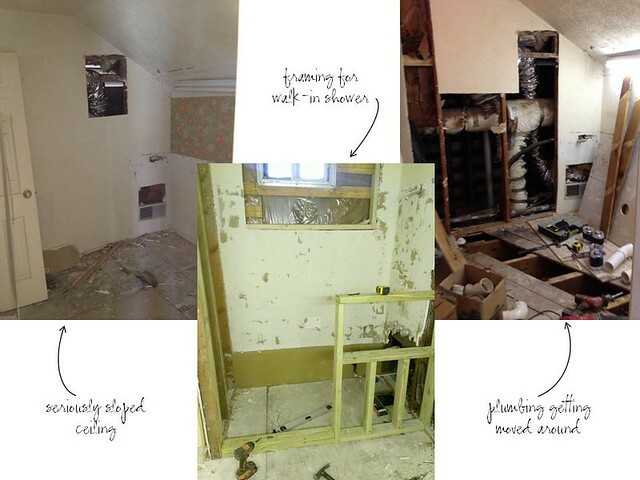 If you’re going to flip this house, your ideas are amazing! You def. have a true talent! Thanks for sharing your experiences! We are in the middle of our bathroom renovation and it is a scary experience. The plumbing in our Victorian house has been a nightmare and we still have one mystery lead pipe that has baffled our builder and plumber. We have had a new water feed installed from the road to give the pressure needed to our new combination boiler to poser our exciting steam shower unit. But I am worried if we have bitten off more than we can chew. We are running 2 weeks late with delays on re-plumbing but the builder thinks we can get back on track soon. My wife is going away for 2 weeks to leave me to it. The most useful experience has been to use pinterest to group together a lot of different product choices and designs. I definitely think the gray floor tile works best.